If you're planning to take an unforgettable trip to the stunning coastline of Amalfi, then you've started at the right place with the Hotel Centrale. As our name suggests, we couldn't be more central to Amalfi's heartbeat. The stately building in which this hotel's set, dates all the way back to 1398, so it's not unfair to claim we're apart of Amalfi's history! The hotel was completely refurbished in 2002 however, so you'll have the unique balance of 14th century architecture and surroundings, matched by 21st century comfort within. We're in the prime location to enjoy all that this wonderful town (or "cittadina" - little city) has to offer. And you needn't ever worry about getting lost, as you'll always be able to find the Piazza del Duomo and with it, us! ...all year round, owing to its stunning coastline, lively atmosphere and breathtaking views. The drive along the coast is astounding and if you're using the excellent bus services available, you'll no doubt be amazed at the bus driver's skills negotiating the rugged and often narrow roads. 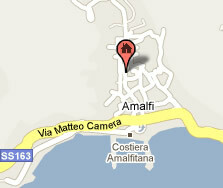 Our goal is to make your time in Amalfi a restful and relaxing one and so our hospitality is designed around you. All the rooms offer you complete independence and we ensure you can wile away the hours in total comfort, should you be able to stop yourself from enjoying Amalfi's intoxicating atmosphere. All along this spectacular coastline you'll be reaching for your camera and no place better to base yourself than the true heart of the coast Amalfi.